This recent Dharma talk by Konin describes three of the many ways that people tend to obscure not knowing. She describes ways of thinking, speaking and acting that sow the seeds of delusion in ourselves and in others, and ways of practicing with these tendencies in order to foster greater clarity. Case 24 from the Book of Serenity - Xuefeng's "Look Out For The Snake"
INTRODUCTION: Can you drop the self or will you get bitten? Xuefeng said to the congregation, "On South Mountain there's a turtle-nosed snake; you people must watch out for it." Chanquing said, "Today in the hall there are many people losing their bodies and lives." A monk quoted this to Xuansha; Xuansha said, "Only brother Chanquing could say this. However, even though he is right, I do not concur." The monk said, "What do you mean, Master?" Xuansha said, "Why use South Mountain?" Yunmen threw down his staff in front of Xuefeng and made a gesture of fright. South Mountain was an actual place near Xuefeng's monastery, but his statement also points subtly to the Southern school of Chan, whose teaching emphasized "sudden enlightenment." The turtle-nosed snake is very poisonous; here it represents delusion, one of the "three poisons" of Buddhism. In this case the snake refers specifically to delusion about enlightenment. Interestingly, the snake is also said to have represented something not as good as a dragon, according to Chinese lore. As dragons are associated with Zen Masters (in fact some have the character for dragon in their dharma name), one might see the snake as Master wanna be. Thus, Xuefeng's admonition means that there is delusion that resides close to home and you should be practicing with this, and it means that his students are deluded about the nature of awakening. Chanquing agrees by saying that the monks in the meditation hall have been poisoned by this delusion, and thus "lose their bodies and minds." When Xuansha hears of this he affirms Chanquing's statement that the monks are deluded. However, he has something more to say. By asking why Xuefeng mentioned South Mountain, Xuansha points out that the poison of delusion is not limited to one place or one idea. Yumen shows just how true this is when he makes his move. The monk's staff is one of her or his personal Dharma accessories. Here it represents the identity, in Yumen's case that of a monk. Or it can also been seen as a precious thing. Either way, he throws it down and pretends to be afraid. This is another reference to Chinese lore, in which a person mistook a stick for a snake, and saw the arising of fear. The moral of the story is that fear arises out of confusion abut the way things actually are. 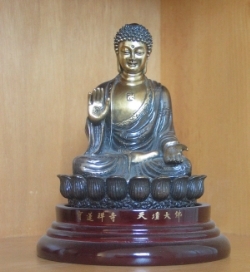 So Yumen's gesture means that when we are confused about the self or when we cling to something precious like enlightenment, it is the source of fear and suffering. However, when we see the self clearly, as it has always been right before us, and perceive the fleeting nature of what seems precious, then we can set it down and, with it, the poison of delusion.